Pot Noodle in the UK has launched a viral spoof on the Guinness Tipping Point dominos effect, just in time for St Patrick’s Day. The action begins in Westport Inn, ignited by a drinker’s fart. Cigarette lighters, cigarette packets and mobile phones set off a chain reaction which includes fridges and microwave ovens. All to end in a Pot Noodle moment. 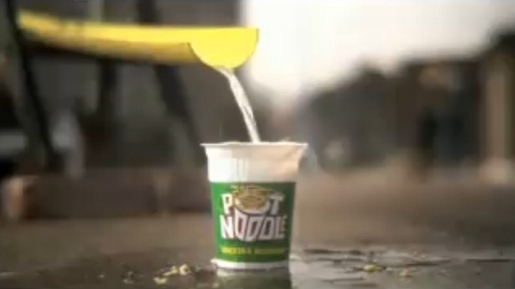 Pot Noodle Tipping Point was developed at AKQA by executive creative director James Hilton, copywriter Colin Byrne, planner Mo Rogers, agency producer Emily Bull and account director Rowena Minhas. Filming was shot by director Dom Bridges via Mustard London with producer Lucy Hayes. Editors were Dom Bridges and Nathan Perry Green at Cut + Run. Post production was by Smoke & Mirrors. Media was handled at Cake Group, London.